Boostive is a robust online platform that allows users to raise money for virtually any cause, whether it’s for a personal cause, charity, business or another type of venture. By creating fundraising pages, raffles and auctions, individuals can reach out to potential donors all over the world. Our goal is to create the most powerful and cost-effective fundraising website that allows anyone from anywhere the ability to raise funds for virtually any cause. Individuals and organizations who are looking to raise money for any number of causes now have an efficient and convenient way to do so thanks to boostive.com. The website, which launched last month, is the most powerful fundraising platform online, allowing users to raise money for personal, business or charitable causes. It leverages the power of social media and the Internet, giving people the ability to share their causes with friends, family and supporters all over the world. 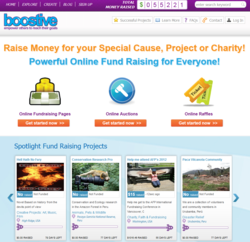 Boostive works by giving users the opportunity to create fundraising pages, auctions and raffles for causes that are important to them, whether it’s for non-profit organizations, medical bills, business capital or more. It opens users up to thousands of potential donors who will be asked to donate small amounts of money—usually $5 or $10. While these contributions are modest for most donors, a high volume of them adds up quickly for those who are raising money for a cause. The idea behind Boostive is to create communities of like-minded individuals who believe in sharing goodwill and who are passionate about helping people and contributing to causes they feel are important. It also serves as a way for charitable organizations to collect secure donations by having many different people fundraise on their behalf. To learn more, visit http://www.boostive.com.